Is China Burning? : Shanghai Index Cracks 2000! 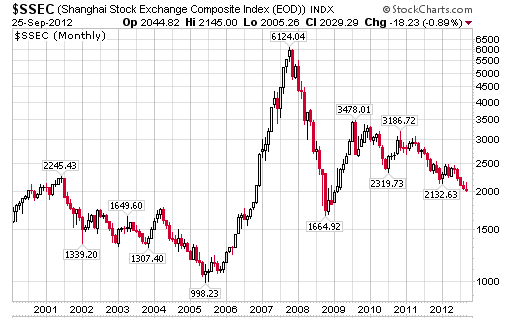 This week the Shanghai stock index, $SSEC, dipped below the 2000 level for the first time since 2009. The following monthly chart puts things in better perspective. Misguided China bulls shorting the dollar and buying Chinese stocks have gotten their heads handed to them on a platter. Those aware of the fraud, corruption, and simple sustainability of economic growth in China either stayed away completely or were short China like Jim Chanos. Chinese stocks in New York slid to a two-week low as the Shanghai Composite Index’s slump below a key level for the first time in three years stoked concern government efforts to avert a slowdown won’t be sufficient. The Bloomberg China-US Equity Index of the most-traded Chinese stocks in the U.S. dropped for a third day, losing 0.7 percent to 90.18 by 12:44 p.m. in New York. The decline followed the Shanghai Composite Index’s descent below 2,000 for the first time since 2009. Mobile-chip designer Spreadtrum Communications Inc. (SPRD) sank after its stock rating was cut. Forbes columnist Gordon Chang asks the question, Is China Burning? Chinese streets were quiet today after anti-Japan protests, many of them violent, rocked more than a 100 cities last week. Large demonstrations continued through Tuesday, the 81st anniversary of Japan’s invasion of Manchuria. The disturbances, triggered by a territorial dispute over the Senkaku Islands in the East China Sea, are commonly described as the worst anti-Japan riots to hit the country since at least 2005, and they may have even been more destructive than that. In any event, the damage to Japan’s business interests in China was substantial. More than a dozen Japanese companies halted operations in the country as fire bombings, sabotage, and looting took their toll. Manufacturers Honda, Nissan, Toyota, Mazda, Mitsubishi, Yamaha, Komatsu, Hitachi, and Canon shuttered plants. Panasonic locked the doors of a factory after employees broke windows, ruined equipment, and set fires. Retailers Aeon, Fast Retailing, Ryohin Keikaku, and Seven & I closed stores. Japanese tourists are canceling trips to China, and hard-hit Panasonic is, not surprisingly, reducing business trips from Japan to the country. As a result, Japan Airlines reduced flights to and from Chinese destinations. It halved Tokyo-Beijing and Osaka-Shanghai flights, for example. All Nippon Airways reported an increase in cancellations on its flights from China to Japan. And it is not only Japanese carriers that have been hurt. China Eastern, China’s second-biggest airline, is delaying the October 18 start of its Shanghai-Sendai route due to insufficient bookings. the Chinese economy is in obvious distress, with fewer analysts buying Beijing’s claims that the country is growing in the high single digits. Charles Dumas of Lombard Street Research, for example, thinks China’s growth rate is only 1.6%, and it could even be lower than that. In this environment, even minor disruptions could have a “tipping point” effect. Moreover, the prospects for Japanese companies will be even worse than it is for others. Who in China is going to buy a Toyota when last Saturday, in an incident now well-known throughout the country, a 51-year-old Chinese man in Xian was savagely beaten—he is now paralyzed and mostly unable to speak—because he was driving a white Corolla? And don’t think this affects only Japanese companies. China’s new ultra-nationalism, on display this past week, can also affect brands from other countries. And we should not think the Chinese are limiting their anger to the Japanese. Last week’s events have been compared, in their intensity and their aims, to the anti-foreigner Boxer Rebellion, which began just at the end of the 19th century. That, unfortunately, is a historical parallel we should remember. Rioters on Tuesday attacked and damaged the car of American ambassador Gary Locke while he was in it. China at the moment is unstable, and that puts foreign businesses there—not to mention the Chinese economy—at risk. A few years ago nearly everyone was a China bull. China, China, China was all I heard at gold and natural resources conferences. My calls pointing out the unsustainability of Chinese growth fell mostly on deaf ears. Remember how in the 1980s everyone thought Japan would soon rule the world. That’s what many thought about China, and still do. I did not buy into it, nor did Michael Pettis at China Financial Markets. Here are a few posts to consider. The idea that China was going to rule the world by the end of the decade was complete silliness. Exponential math, as well as energy constraints said it would not happen. Malinvestments and fraud were simply icing on the absurdly-bullish cake. That said, as compared to a few years ago, or even earlier this year, sentiment on China has soured remarkably. The fundamentals did not change, just the sentiment. Indeed, sentiment is now so sour on China that a nice rally may happen at any time. This is not a recommendation that people buy into China, rather it’s a suggestion that sentiment is now moving towards extreme pessimism. Reversals from such extremes can lead to powerful rallies. 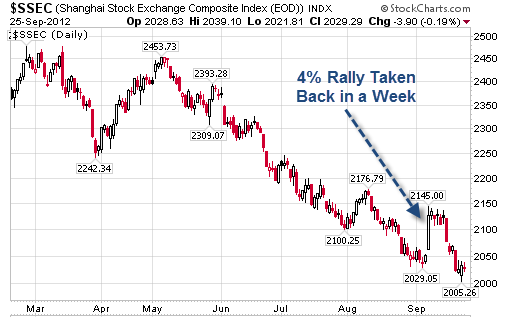 However, timing the reversal is problematic as the four percent rally quickly taken back shows.